Following hot on the heels of yesterday’s Coffee Spot, Spitfire Coffee, comes Spitfire’s new big sister, Pax Treme, which I visited last Sunday. I’d not heard anything of Pax before I arrived in New Orleans, but that’s probably because it only opened the Monday before my visit. Talk about good timing! I’m indebted to Marissa, the barista at Spitfire, who gave me the heads-up about Pax. It has perhaps the most (initially) unpromising location for a coffee shop, almost directly under an elevated section of the I-10 freeway which thunders through the heart of New Orleans Tremé neighbourhood, north of the French Quarter. About 10 times the size of Spitfire, and that’s not counting the balcony, it’s a handy getaway from the hustle of the French Quarter and just a short walk away across Louis Armstrong Park. Like Spitfire, Pax is a multi-roaster, with a single-origin on espresso and three more available either as espresso (ground using the Mahlkönig EK-43) or pour-over through V60 or Chemex (with plans to add Kalita Wave and maybe Aeropress, plus bulk-brew) There’s also a kitchen at the back, so Pax has a small (for now) breakfast/lunch menu, plus cakes, all baked on-site. March 2019: I’ve learnt that Pax Treme has had to close due to a series of unfortunate incidents. The word on the ground in New Orleans is that it may re-open soon, which would be excellent news! From the outside, Pax looks distinctly unpromising, but have faith. Occupying a tall, brick-built building which was once a famous jazz club, the entrance is via a single door in the centre of an otherwise featureless (and windowless) brick façade. Inside, Pax stretches out ahead of you, as well as soaring above you, the space open to the ceiling. There’s very little natural light, other than what comes through the glazed door and the occasional narrow window high up on the left-hand wall. However, that all adds to the atmosphere. The layout is simple, but elegant, a large, brick-built counter on the right, semi-open kitchen at the back, and seating to the left, complete with balcony running the length of the left-hand wall. Directly ahead of you, a row of brick pillars separates the seating (left) from the counter (right), a half-height set of bookshelves occupying the gap between the first two pillars. The seating starts with a large sofa facing the counter, along with an armchair facing the door. Behind that a large, six-person communal table, followed by the water/cutlery station. Meanwhile, a row of four, four-person tables shelter under the balcony. There’s then a large space before you get to the kitchen at the back, where you can sit at one of two three-person bars facing into the kitchen, separated by a third brick pillar. There’s also another sofa tucked away under the balcony to the left. Immediately to the left of the door, steps lead up to the balcony. This runs along the left-hand wall, extending slightly around the back wall over the kitchen. A row of stools overlooks the ground floor, with great views of the counter, while a row of two-person tables lines the left-hand wall. Finally, right at the back, looking the length of the balcony, is a four-seater sofa. I was there for breakfast, choosing the biscuit, bacon, egg and cheese for breakfast with greens instead of bacon and a side of crushed potatoes, an interesting and very different breakfast from what I’m used to. The biscuit was sliced in half, toasted and then stuffed with eggs, cheese and greens, a really tasty concoction. The crushed potatoes were pretty much as described, small potatoes crushed flat and pan fried. They were delicious too. Purely by chance (owner Scott had picked the best-tasting coffees), all Pax’s initial offerings were Colombians from B&W, Sweet Bloom and Onyx. The only exception was the espresso, a Geisha from B&W. Having first come across Onyx at Vice City Bean in Miami early in the year, I went with that (also Scott’s recommendation) as a V60, fearing it would be too funky as an espresso first thing in the morning. In the bag it smelled amazing, while in the cup, it was initially a little disappointing, but as it cooled, it really came into its own, developing a rich sweetness that you rarely find in coffee. It lost a little sweetness as it cooled further, but that only allowed the fruity notes to come through even more strongly. Intrigued, I tried it as a split-shot, espresso/macchiato. 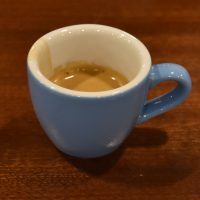 As an espresso, it wasn’t as funky as I feared, a very pleasant, but very different coffee, with a centre-of-the-mouth taste and none of the sweetness that came through in the pour-over. In milk was my least favourite, but that’s in comparison to the previous two. There were plenty of classic notes coming through, but the milk and coffee always felt slightly at odds to each other. It’s early days for Pax, so watch this space. Plans include an expanded food menu and roasting! December 2018: Pax Treme has won the 2018 Best Filter Coffee Award and was a runner-up for the 2018 Best Breakfast Award. This entry was posted in Breakfast, Cafes, Cake, Closed, Lunch, New Orleans, Retailers and tagged include by Brian Williams. Bookmark the permalink.